4-Isabella Murray was born on 8 Jun 1829 in Macquarie River, Campbell Town, Tasmania, was christened on 16 Dec 1830 in Kirklands Presbyterian Church, Campbell Town, and died on 8 Aug 1900 in Home of daughter Emily, 48 Elizabeth St. Launceston, Tasmania at age 71. 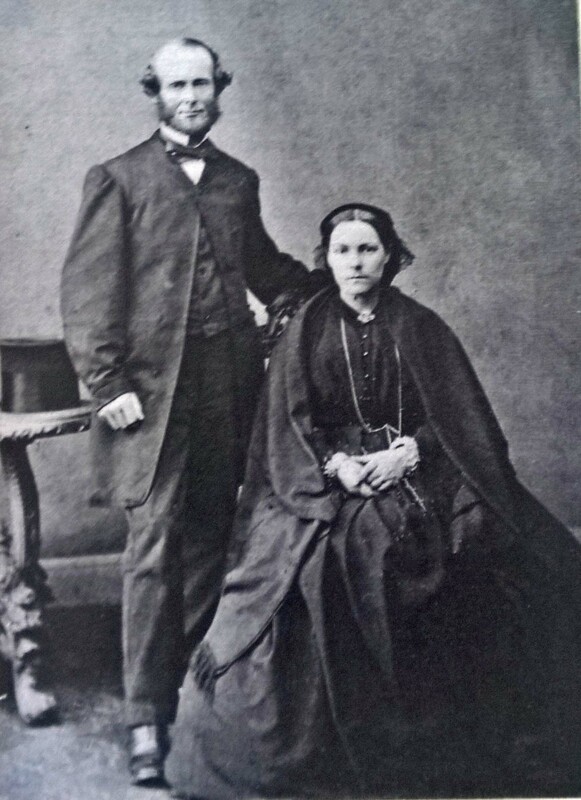 Isabella married Charles Harris on 19 Jan 1853 in Home of Mrs Murray, Longford, Tasmania. Charles, son of Thomas William Harris and Louisa Lawrence was born about on 8 Jul 1823, baptised at Saint Paul, Deptford Kent England on 3 Aug 1823 and died on 22 Oct 1889 in Westbury, Tasmania at age 65. They had eight children: Charles Francis, Leonard Montague, Rosalie Dove, Emily Grace, Annie Addella, Alfred, Margaret Bertha and Thomas Carmichael. The story of the search for Charles' origins is told here. 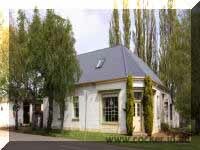 The story of his family, including two brothers who also emigrated to Van Diemen's Land, is told here. Charles was party to a petition by landholders and householders in the district of Glamorgan and Cornwall, published in the Launceston Examiner on 15 Sep 1852, calling for a meeting of the landholders and householders of the said district for the purpose of "electing trustees, for the purposes of superintending, providing for and effectuating the construction, repair, and maintenance of the roads in the said road district". The Cornwall Chronicle on Saturday 22 January 1853 reported the marriage at Longford, on Wednesday, the 19th inst., by the Rev. Mr. Innes to Isabella second daughter of the late Mr. David Murray, to Charles Harris, of Swan Port. Charles, bachelor and farmer, and Isabella, spinster, were married by Jonathon Innes according to the rites and ceremonies of the Wesleyan Church in the private Longford home of Mrs Murray in the presence of witnesses D. Murray and William Harris. The Colonial Times Hobart 7 November 1854 includes a public notice signed by leading local identities such as George Meredith, Joseph Tilley, the Reverend Thomas Dove, John Amos and Charles Harris calling upon Charles Meredith to accept nomination as a member of the new Legislative Council. In the Colonial Times Hobart Friday 5 October 1855 appears another public notice to which Charles Harris is a signatory. GENTLEMEN,-We the undersigned invite you to attend a meeting, to be holden at the Swansea Hotel, Swansea, on Thursday, the 11th day of October, at twelve o'clock, at noon, for the purpose of taking into consideration the best means of expressing our approval of-the course pursued by our honourable member in the Legislative Council in demanding the attendance of Dr Hampton before the select committee, appointed to enquire into the alleged abuses of the Convict Department. John Meredith, James Amos, A Graham, John Amos, John Webster, Robert Makepeace, James Fieldwick, James Hurst, Jacob Goddard, Samuel Walboo, Edwin Boutlbee, William Graham, Kevin Quiet, Patrick Cusick, William Carpenter, Charles Quin, Thomas Minshal, Charles Harris, Richard Gathercole, JP. King, William Hepburn, George Cotton, Edward Tilley, John Ferguson, William Bellchambers, Edwin Allen and Joseph Tilley. A Location of 900 Acres, taken in early times by the present proprietor, now occupied by Mr. Harris, whose lease will expire on the 13th January, 1853 (sic). This is an excellent grassy property, with a good marsh farm, situated nearly in the centre of Great Swanport, about six miles from the shipping-place. It is all fenced and subdivided. There are about 100 acres in cultivation, a cottage, and boarded barn, etc. and adjoining about 2000 or 3000 acres of the best sheep run (Crown land) in Swanport, which will be-transferred to the purchaser. The Shepherd at the doe level will show this run. Harris, Charles, Eli Lodge, householder, house and farm of Eli Lodge, property of William Hepburn. FreeStone is again offered for sale in the Hobart Town Daily Mercury on Saturday 26 May 1860 but the property is by then leased to another, Henry Lyne. Charles and Isabella had moved by then. 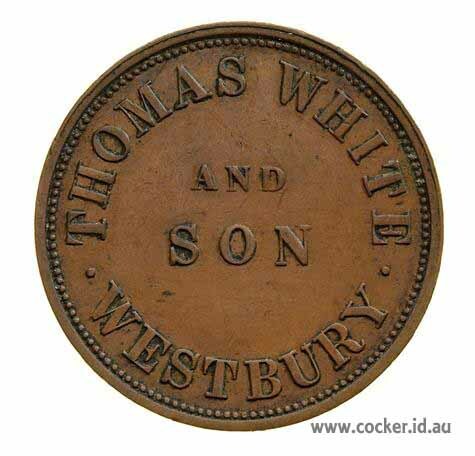 He originally leased Thomas White's Westbury store from solicitors Messrs Green and Co. of Launceston. When first daughter Rosalie Dove was born in Launceston on 4 Jan 1857 her father's occupation was recorded as grocer. When Annie Addella was born in October 1859 in Westbury her father's occupation was recorded as Shopkeeper. The Cornwall Chronicle reports on Saturday 19 Jan 1861 that the General Store and business at Westbury hitherto conducted by Mr Harris for Messrs Richard Green and Co. will from this date be carried on in the name of CHARLES HARRIS & Co. In 1841 ex-convict Thomas White was granted one acre, two roods and six perches of land on the corner of King and Adelaide Streets. He borrowed six hundred pounds from Henry Reading to finance the construction of buildings on the site and, in 1846 when this loan was secured by a mortgage, a store and domestic residence known as Thomas White's Token Store had been completed. 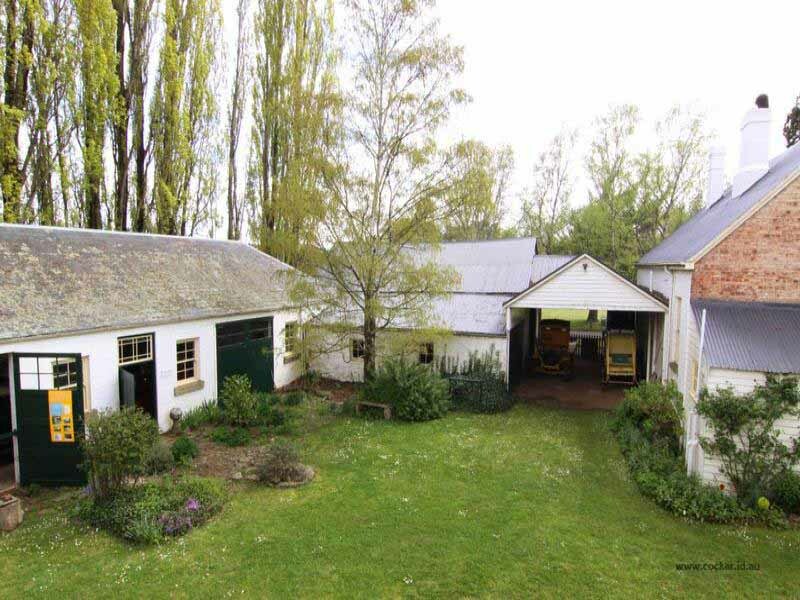 By 1853 the buildings consisted of the store with original dwelling above and at back, a large bake house that had been the original home, a commodious coach house and very adequate stone stables. He had penny and halfpenny tokens made by Heaton and Sons Mint, Birmingham in 1855 which could be used to buy goods in the store. 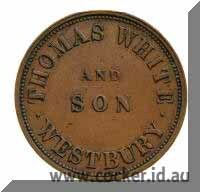 However when a ship carrying uninsured goods from England sank on the way to Tasmania the White's prosperity also sank and Thomas White was insolvent by 1864 and the property was sold. 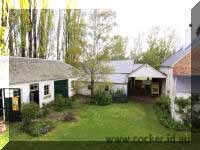 The property almost a village in itself, consists of a number of buildings built around the central courtyard, including the main house consisting of 10 rooms, wood-fired bakery, stables and coach-house, the mill building, originally built as a warehouse and also an extensive garage area. For the past 40 years, White House was been occupied by the White House Museum, exhibiting an outstanding collection of furniture and displays, and the wood-fired bakery, which still operated until the buildings were sold in 2010. Launceston Examiner, Tuesday 30 June 1863, page 5 (and many others). Congregational Chapel at Westbury It will be seen by an announcement in our advertising columns that it is intended to erect at Westbury a place of worship in connection with the Congregational body. The estimated cost is £350, and subscription towards the object may be forwarded to Messrs. Charles Harris and John Gurr, Westbury and Mr. George Pullen, Exton. When Alfred was born in 1864 Charles was recorded as a storekeeper and in 1867 a merchant. A major fire occurred late in the evening of 12 Mar 1872 and it destroyed the building and contents although the flour mill and adjoining stores were saved. The general store, originally created by Thomas White, was insured but did not reopen, although the steam flour mill continued. The Launceston Examiner Tuesday 12 Mar 1872 Page 2. Fire at Westbury. (From our own correspondent.) Westbury, Monday, 4 p.m. The most serious fire that has taken place here for many years occurred on Saturday night, when the brick-house occupied by Mr. Charles Harris, storekeeper (late T. White & Son), and long known as the largest and best built premises on the township, was totally destroyed. It appears that, with the exception of Mr Harris's oldest son, Mr Harris and all the other members of his family had retired to rest. About half to 11 Mrs Harris, who was not asleep, heard a noise, and awoke her husband up telling him she thought she heard the front door slam. Mr. Harris immediately got up, dressed, and went down stairs, and opening the door which separates the shop from the dwelling portion of the building, was met by a dense volume of smoke. He immediately aroused his family, and with very great difficulty succeeded in removing them in their night-dresses just as they were. The alarm was given, and in an incredibly short space of time the whole building was in flames. A largo concourse of persons assembled, and every effort was made to save some of the furniture and stock. For some minutes at first intense anxiety was felt lest two of Mr Harris's children had been left sleeping in their room, which was immediately over where the fire was strongest; that fear, however, fortunately proved groundless. All present set to work with a will to save such property as they could lay their hands on, but the speed of the devouring element was so rapid that but little could be done in that way. Most fortunately the air was perfectly calm, and to that circumstance only can it be attributed that the fire was confined to the one building. Had there been any wind, from the dry and inflammable condition of everything about it, it is impossible to say where the fire would have ended. At present it has not been ascertained how this fire originated, but as it was first observed in a corner of the shop, where lucifer matches were kept, it is probable that some of them became ignited in some unaccountable manner. An inquest will be held on Friday next at half-past 10. After the family had retired to rest, Mrs Harris smelt fire, and immediately rose, and went into the bedroom occupied by her eldest son (who was sitting up reading, and was the only one in the house who had not gone to bed) to see if he had been burning any paper. From him she learned that only the moment before he had noticed a disagreeable smell as if of burning. They two ran into the room in which some of the children slept, and it, was supposed they wakened them up, and took them away, for Mr Harris who rushed to the children's room shortly afterwards, found that his son had broken in the door, and concluded that the room was empty. The smoke had by this time become so dense that it drove Mr Harris back. Subsequently it was discovered that two of the children were missing. After some delay Constable Piercey, in the bravest manner, penetrated through the suffocating smoke to: the children's room, and brought them down in safety, one under each arm, and both sound asleep. There can be little doubt that, but for his intrepid conduct they would have perished in the burning building. Another constable was particularly active in saving property, and the neighbours did all they could under the circumstances. The fire is supposed to have originated in one or two-corners of the showroom on the lower floor. The flames obtained such a hold that only a small portion of the stock and some furniture were saved. The work of destruction was so rapid that all danger was over in about an hour and a half and so complete, that the place was entirely gutted-scarcely a vestige of the woodwork was to be seen. The building and contents are far more than covered by insurance, and the stock was much smaller than when the policies wore effected. The premises (including the flour mill and adjoining stores, which fortunately were saved) and contents were insured in the Cornwall Company for £2,780, in the Derwent and Tamar Company for £2,000, in the Northern Company for £1,300, and in the Liverpool and London and Globe Company for £3,000. A policy effected with the Imperial Company for £1,800 had recently lapsed 'The Shop had been closed on Saturday night at the usual time, namely, a quarter to 10 o'clock--just about an hour before the alarm of fire was given. Fortunately there was no wind, and the fire was confined within the walls of the building in which it commenced. John McKAY, late of the firm of Hunt and McKay, begs leave to thank the public for their patronage during the last four years. Having himself taken the Westfield Mill, Westbury for a term of years, he respectfully solicits their continued favours, and hopes, by strict attention to business and a good article, to continuo to merit their confidence. Good storage for grain. The Reverend Thomas Dove was a Minister at the Wybalena Settlement and then was in charge of the District of Swanport for thirty-nine years until his death. He died at his home, the Manse, Glen Gala on 28 Aug 1882. 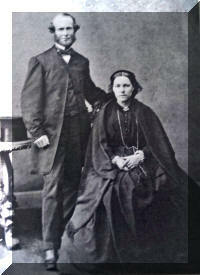 His widow then went to live with the Harris family at Westbury until her death in 1885. Their first daughter, Rosalie Dove Harris was presumably named after them in 1857. Mrs Dove's death was reported in the Examiner. WESTBURY FROM OUR OWN CORRESPONDENT Mrs. Dove, a very old and much respected lady, who has for some time been living in the family of Mr. Charles Harris, died suddenly this morning. Deceased not appearing at her usual time, one of the Misses Harris entered her room and there found her lying dead on the floor. The deceased lady had been attended for heart disease, which was no doubt the cause of death. An inquest will be held this evening. The deceased lady had attained the ripe age of 75 years, and was the wife of the late Rev. T. Dove, formerly of Swansea. She arrived in Hobart when only 17 years of ago, and has lived in the island ever since. It is not yet entirely clear exactly what Charles did in later life. He did not re-open the general store after the 1872 fire and he leased the mill. His death certificate, letters of administration and inquest describe him as an agent or commission agent. 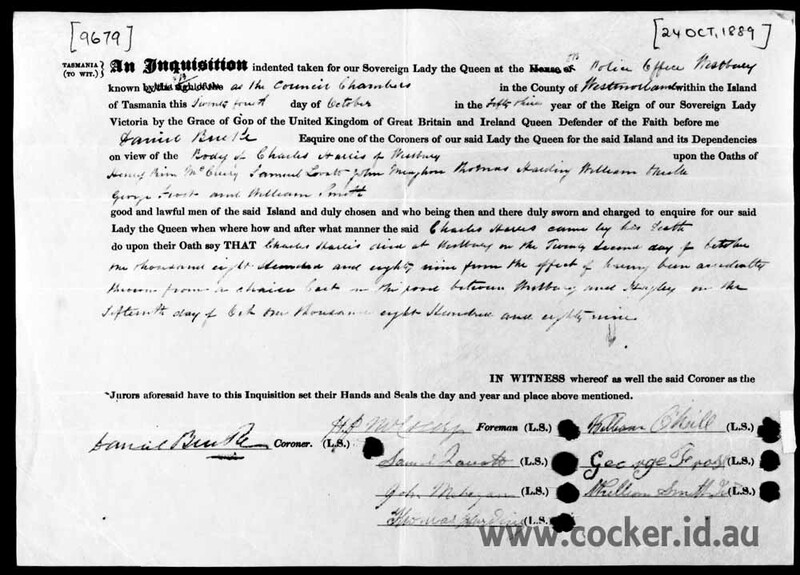 The death certificate of his daughter Emma Grace describes the occupation of her father as a commercial traveller. In April 1886 Charles initiated legal proceedings against John Mckay for allegedly failing to maintain the premises in good while leasing them. The court case was reported at length in both the Hobart Mercury and the Launceston Examiner on Thursday April 1886. A Small Debts Sitting of the Supreme Court was opened at 10 o'clock this morning, before His Honor the Acting Chief Justice (the Hon. W. R. Giblin). HARRIS V. MCKAY.-This was an action brought by Mr. Charles Harris, of West bury, against Mr. John McKay, miller, of the same place, to recover the sum of £86 10s. for breach of agreement respecting the defendant's tenancy of the Westfield Mill at Westbury, owned by plaintiff, which plaintiff alleged was not given up in good order and repair, and the roof of a store had not ben shingled according to agreement. The defendant pleaded not indebted; that he was not tenant to plaintiff; did not agree to do the repairs or give up the' premises in good order and repair; that when possession was given up the promises wore in as good order and repair as when defendant first occupied them, making reasonable allowance for wear and tear; and that he had not removed any fittings or parts of the machinery. Mr. Byron Miller appeared for the plaintiff, and Mr. G. T. Collins, of Messrs, Douglas, Collins and Davis, for the defendant. Jury: Messrs James 'Maddox, John Sparrow, and H. T. Russell. Charles Harris deposed he was the plaintiff in this action, and owned the mill at Westbury recently occupied by John McKay, the defendant, as a miller. Defendant entered on occupation of witness' mill, as witness' tenant for the four years from 1870 to 1880. A fresh arrangement was then entered into for four years only, and a few days afterwards an arrangement was made about some stores at Westbury. The latter arrangement was by word of mouth only, the words being used by defendant were, "You will not take the store from me." The defendant had paid no rent for the store, the only condition being that it should be shingled. At the period of the second agreement the mill and machinery required some repairs, and witness gave up £20 out of the rent to offset these. This sum, with what plaintiff and his sons did themselves, put the mill and machinery into good order and condition. The belts had been on some six years ago, and were on when the last tenancy commenced. They were put on by McKay, and were a necessary portion of the machinery, which would have to be replaced if worn out. By an arrangement between them the agreement was continued for another year upon the same terms. Within the last 12 months the defendant asked for a longer term for the whole of the premises, offering to carry out several alterations and repairs, but nothing came of this. In September or October last year defendant came to witness and gave a cheque for the rent, and asked what was the most honourable way of giving up the mill? Witness said that all he wanted was that it should be given up in good order and repair, and the understanding was that possession was to be given up at the end of the year. The key was given up on the 31st of December, and witness served McKay with a notice that a survey by an engineer would be made, but McKay tore it up, and said he did not care a snuff for the survey. The survey was made by Mr. James Scott in the presence of witness within a few days of that notice. The mill was not in good order and repair when it was given up. Through the flywheel working loose, the bearing of the shaft in the wall was so shaken as to destroy the wall. The cylinder heads were packed with rags Instead of proper packing, and the bolts were taken away. The boiler and flues had not been cleaned out for over 12 months, und the defendant had not re shingled the store. A quantity of shingles had been procured, presumably for, the purpose, but had not been used, and had been taken away. Inconsequence of the state defendant had left the mill and store witness had been unable to let the premises. Cross examined by Mr., Collins: Witness had owned the mill 15 or 16 years, and prior to defendant's occupancy of it for 9 years witness had occupied it himself. During the 9 years defendant had occupied it witness had not spent any money on repairing the mill beyond the 20 allowed out of the rent but he and his son had worked at it sometimes. There, was no survey made as to the state of the mill previous to defendant's occupancy. It had been vacant for some time previous, but he could not tell whether it was one, two or three years. He lived near the, mill, and had never served any notice upon defendant to make any re pairs, because they had always been effected. He had heard that defendant was taking another mill in opposition to his, but that had not actuated him in serving notice of survey. He was induced to do this on account of the fact during the last year defendant had allowed the place and machinery to get out of repair. The mill had been used by defendant up to the last days of his tenancy, and had been used a little by plaintiff since. The stores had not been given to the defendant because the mill was too weak to store grain in. Re-examined by Mr. Miller: The condition under which defendant held the stores was that he should re-shingle them and deliver up in good order and condition. James Scott, mechanical engineer, deposed to surveying plaintiff's mill at Westbury, at his request, and having made a report in which he estimated that it would cost £40 to put the machinery in fair working order. The machinery seemed to have been fairly worked, but it was worn out by age. It would not be fair use to work a flywheel while it was loose. He had known worse things than packing a cylinder with rags for temporary use, though it should have been properly packed subsequently. Leaving a boiler and flues dirty would not harm the machinery, but it would result in loss to the tenant. He thought the machinery had been fairly used on the whole. William French, carpenter, Westbury, deposed to examining the mill about a month ago. He estimated it would take £15 to shingle the store, £3 10s for flooring. Cross-examined by Mr. Collins: There wore some boards there, but the estimate was for new boards. The estimate for shingling was for the whole of the building, including the coach house occupied by plaintiff. To Mr, Miller: New boards wore required. The coach house portion of the shingling would come to £4 10s. William Bailey, carpenter, of Westbury, deposed that defendant consulted him with reference to repairing the floor before he left the mill. Thomas Harris, son of the plaintiff, deposed that the mill and premises were not in good order and repair when defendant gave them up. For the defence, Mr. Collins contended that the evidence had not proved that the want of repair resulted from anything but fair usage, which he would further bear out by the evidence he would call on the part of the defendant. John McKay, defendant, deposed that nine years ago he entered into the agreement referred to in co-partnership with Mr. Hunt. Subsequently the arrangement was renewed for four years, and failing to effect an arrangement for a long lease, It was renewed at the end of the eighth year for twelve months longer. During the last five years the witness had honestly kept the mill in good working order by carrying out repairs as they were needed, the cost of substantial repairs to him during the time being about £140. When he left the premises at the end of last year they were in much better condition than when he received them. He gave £45 for a special machine for dressing the flour, the old one not being good enough to turn out flour fit for market, and renewed the silk for dressing, besides getting timber for hoppers, and other repairs. The store was given to witness to put grain in, on condition that he would not load the mill, as the corner was cracked and the wall bulging out. The second store was given to him for use in part of one year on condition that he shingled it, and he provided the shingles required. Since 1884 the plaintiff had resumed possession of the same store. He had consulted the witness Bailey about raising the floor, not that he felt bound to do so, but because he desired to do so as an honest thing. The mill building was a very old one, and had been converted into a mill 20 years ago to witness' knowledge. The bells that were in the mill witness put away when he took possession, and left in the same state behind him when he gave up the premises. All the time he had been there he had been troubled with the fly wheel, which would not keep keyed up, though the plaintiff had tried several times to improve it, and witness had spent hours over it without being able to do anything with it. Cross examined by Mr, Miller: There was no reference to the store in my agreement. Plaintiff had never complained to witness about his using the fly wheel loose. Joseph Smith, Miller, residing near Westbury, deposed to frequently visiting the mill during the last two years of Mr. McKay's tenancy, and finding the machinery in good working order. Albert Hunt deposed he was a partner with McKay in the occupancy of the mill from 1877. James Low deposed he was in defendant's employ as engine-driver for the whole nine years, during which he occupied the mill. The machinery was pretty good, but several repairs had to be made to the boiler. When defendant left the boiler and machinery were in as good order as when he first took it, repairs having been effected from time to time. Isaac James, baker, residing at Westbury, deposed to receiving flour from defendant's mill up to the end of last year, the quality of which was as good as usual. Samuel Bendall corroborated the evidence of the last witness, and , both counsel then addressed the jury, reviewing the evidence given. His Honor summed up, pointing out that nearly everything depended upon the common sense and feeling of justice between man and man. That the jury would bring to the interpretation of the agreement to keep in good order and repair. The jury retired at 2.30 to consider their verdict. SUPREME COURT SMALL DEBTS SITTINGS. WEDNESDAY, APRIL 7. Before his Honor the Acting-Chief Justice, hon. W. Rt. Giblin. This was a claim to recover £86 10s from the defendant as tenant of a mill, with buildings and machinery at Westbury, known as Westfield mill. Mr. R. B. Miller appeared for the plaintiff, and Mr. G. T. Collins for the defendant. The following jury were empanelled: Messrs. Maddox, Sparrow, and H. T. Russell. Charles Harris deposed he was the owner of the Westbury mill, and in 1881 he let the mill (agreement produced); some few days after an arrangement was made to lot defendant the stores, the only condition being that defendant should re-shingle them: he let the mill, as furnished with all gear; when the second term of agreement was, made he allowed the defendant £20 for repair to the building; two belts to the machinery were removed and taken away by the defendant; they were both on the machinery when the agreement was made; they were a necessary part of the machinery; in September last the defendant gave him a cheque for the rent and asked what was the most honourable way of giving up the mill; he (plaintiff) replied that he only wanted it left in proper repair, and asked defendant if he understood him to wish to give up the mill at the end of the year; defendant replied " Yes"; before the defendant gave up possession he did not examine the property, but he did afterwards when the key had been given up; he handed the defendant a copy of notice (produced) on 1st December, and defendant tore it up and said " he did not care a snuff for surveys" and that plaintiff knew where to find him if he was wanted: he (plaintiff) had a survey made by Mr. James Scott either on the 2nd or 4th January, and the document produced was his report thereon; the mill was in bad order and repair when given up, and the building was very much shaken, caused by the defendant working it with a loose fly wheel; the cylinder heads were improperly packed with rags, and the bolts were taken away; the boiler and the flues had not been cleaned out for upwards of twelve months; the store was not re-shingled according to agreement; during the defendant's tenantry he had procured a quantity of shingles for the purpose, but before his tenantry expired he removed them; he (plaintiff) had been unable to let the mill because it was not in a fit condition to work; he had expended money in repairs. Cross examined--He had been the owner of the mill for the last 15 or 16 years and previously to the defendant's tenantry the mill had been worked by himself; he could not say what condition the mill was in when the defendant took possession; during the nine years the defendant occupied the farm he (plaintiff) had only expended £20 on the premises; he had no survey made at the time, nor was there any list made of the articles left on the mill; the mill had been unoccupied for some time before the defendant took possession; he could not say whether it bad been unoccupied two or three years; he never gave any notice to the defendant to effect repairs, because he (defendant)always made them; during the five years that the defendant had failed to shingle the roof the s ore, he (plaintiff) never asked the defendant to do so; the mill was going up to the last hour of defendant's tenancy; he (plaintiff) had been using the mill still for grinding; there was nothing the matter with the boiler beyond fair wear and tear; he believed, the boiler had been taken every care of. James Scott, an engineer, deposed that he was employed to survey the mill and machinery and the report produced was the one he made at the time; to put the machinery into proper order would cost about £40; the machinery had been fairly used, but seemed to have worn out with age; not keeping the flues clean would not injure the machinery. Cross examined-All the repairs required were required were caused by honest wear and tear; it would be possible to work the mill with the fly-wheel loose, but it would be to the detriment of the persons working it. William French, a carpenter, residing at Westbury, deposed that he had examined the buildings belonging to the plaintiff about a month ago; he estimated the cost of repairing the floor would be 15 pounds; the repairs were needed to put the building into a proper state. Cross examined - Loose boards would last about five years; the shingling of the roof was to cover the whole of the shed, including the coach-house belonging to the plaintiff. William bailey, Thomas Harris, son of the plaintiff, important evidence, which closed the case for the plaintiff. Cross-examined- It was true he tore up the notice that was that was served upon him by the plaintiff. Joseph Smith deposed, that he was a miller, and had practical experience; he knew the mill in question, and had been in it just prior to the defendant leaving it; it was in good going order. A. Hunt, T. Lowes, J. James, and S. Bendle gave evidence as to the good condition of the mill, and of the quality of the flour produced, showing that the mill was in good working order up to the cessation of defendants' tenantry. Mr. Miller addressed the jury at some length for the defendant and his Honor summed up, forcefully reviewing the evidence on each side. The jury then retired, and after an absence of a quarter of an hour, returned into Court with a verdict for the plaintiff for £5, being the value of the bonds. This concluded the business, and at 2:40 the Court rose. Charles died at Westbury on 22 October 1889, aged 65. An inquest held at the Police Office, Westbury on the 24th October before D. Burke, coroner, found that he died on 22nd October from the effects of having been accidentally thrown from a chaise cart on the road between Westbury and Hagley on the 15th October 1889. This was a claim for £50, for breach of contract. Mr E. O. Miller appeared for the plaintiff, and Mr L. Parker for the defendant. Jury-Messrs D. I. Ritchie, J. A. James, and J. T. Farmilo. Mr Miller explained the plaintiff's case Mr Miller explained the plaintiff's case to the Court. Matthew Hill deposed he was a commission agent; the house in question, over which the present proceedings were initiated, was placed in his hands to sell; the defendant entered into negotiations to purchase the property and eventually did so; he agreed to pay two-thirds of the purchase money to the Equitable Building Society; witness did not notice any dampness in the place, which was in good order. Charles J. Harris, husband of the plaintiff, deposed that he first saw the defendant in regard to the purchase of the house; after an agreement had been drawn up by him and the previous witness, it had been discovered that the liability due to the Building Society was more than at first anticipated; the purchase was concluded in October last for £214 5s; witness showed the defendant and his wife all over the house before October 31, and they found no fault with the place; about two years since a little damp was discernible in one of the front rooms, but it had been attended to, and the discolouration on the wall paper had been removed; the contract was never completed by the defendant; witness did not at first tell the defendant the house belonged to his wife. At this stage of the case Mr Parker applied that the plaintiff should be non-suited. He contended that the contract had been made out in the name of Charles Harris instead of that of the plaintiff. Accordingly the proceedings should have been taken by Charles Harris, the party who signed the contract. The objection was upheld by the Commissioner, and the nonsuit granted. 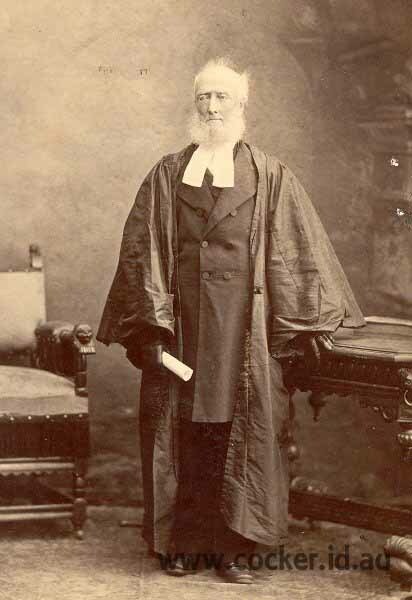 Charles died without a will and, on 26 Jul 1890, Daniel Burke was appointed by the Supreme Court as administrator of his estate, which was later valued at eighteen hundred and sixty pounds. A few weeks later, on 8 Aug 1900, Isabella died at 48 Elizabeth Street, Launceston, home of her daughter Emily Wettenhall. This home was opposite St John's Church and was demolished when a council car park was constructed. The Launceston Examiner, Friday 7 Nov 1890 reported that the property (which had been the subject of the failed legal action for rising damp) in the estate of the late Mr. Charles Harris, in Lyall street, in the occupation of the Messrs Barrett, had been purchased by Mr. Thomas Barrett at a fair figure. Three further sales were advertised. Lot 1.- 1a. 2r. 6p., alt angle of King and Adelaide Streets, Westbury, with all buildings thereon, known as "Old Mill," and occupied by Mr. A. J. Scott; together with machinery therein. Lot 2.- Property in King-street, known as "Old Brewery." Reference, Messrs. Douglas land Collins, Solicitors, Launceston. Valuable Property at Westbury. W. T. BELL AND CO. are instructed by Daniel Burke, administrator in the estate of the late C. Harris, to sell by auction at the Society's yards, Westbury, on THURSDAY, November 27 (day after the show), after the stock sale, That valuable property of the Steam Flour Mills, known as WESTFIELD MILLS, Situated King-street, Westbury, together with adjoining well fitted up store and dwelling-house, containing nine rooms and pantry also other outbuildings suitable for storage, coach-house, stable, garden, and paddock, area of the whole one and a half acres. The mill is in good working order, and being centrally situated in a large district, offers an inducement for a flourishing business. 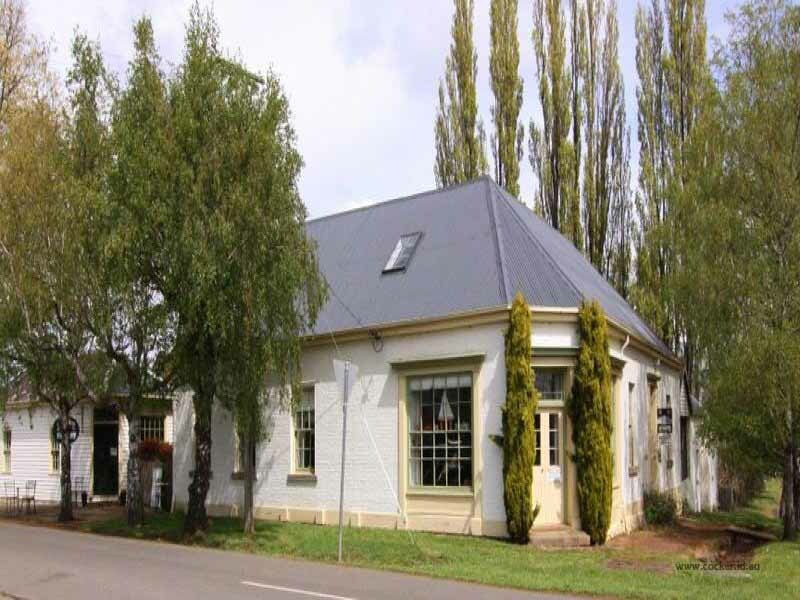 Also Cottage and shop in William-street, now in occupation of Mr Roots. Terms-25 per cent. cash deposit, balance on completion of transfer. W T Bell and Co are instructed by Daniel Burke, administrator in the estate of the late Charles Harris to sell at auction at the Westfield Mills, on Monday, December 1 at 12 o'clock, Household furniture and sundries. The premises were operated by the National Trust as a leading Westbury tourist attraction for a number of years.